When you want to go barelegged while still wearing your lightest, most stylish shoes, you need an equally lightweight and stylish way of protecting your feet. 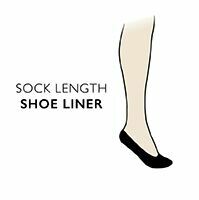 Falke Elegant Seamless Step Invisible Socks are cleverly designed to provide an extra-durable and fine ‘second skin’ for your feet without aggravating stitched seams. Falke Elegant Seamless Step Invisible Socks use an innovative bonding technique to eliminate stitching entirely. A silicone anti-slip system bonded in stops the socks from skidding during wear and extra low cut flocked edging makes them a perfect fit that won’t be noticeable in use. These are a real revelation that you need to try!